To keep check of the Scots who constantly attacked south of the border, defensive castles were erected across northern England. In 1415 a survey listed 113 castles in Northumberland alone. After the Battle of Crecy during the Hundred Years War, victorious English soldiers brought home from France new-found riches and military experience. Sir Thomas de Lucy, one of the heroes of Crecy, returned to Northumberland to rebuild his castle that was destroyed by a Scots army led by David Bruce. 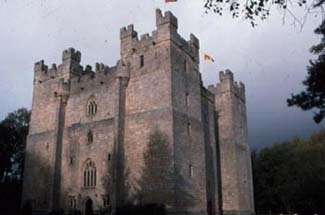 Langley Castle took nearly twenty years to build, and de Lucy died soon after its completion. His daughter, married to the earl of Northumberland, Henry Percy, took possession of the estate. Percy conspired in a failed plot to overthrow the English King Henry IV and fled to Scotland. In turn, King Henry IV burned the castle. By the 17th century, the Catholic earls of Derwentwater gained the property, although they never lived there. The Crown took over the estate until 1882, when a local historian, Cadwallader Bates, bought the castle with the intention of restoring its former glory. Incorporating the remaining walls and towers, he built a new roof, stairway, and entry as well as battlements and floors. Nothing was added to detract from the original fortress. After his death in 1902, his wife Josephine continued the restoration. She is buried next to him on the castle grounds. Prior to its life as a hotel, the castle served as a military barracks during World War II, a school for girls, and then as a banqueting house. Opt for the atmospheric character rooms inside the castle. The “castle view rooms,” although nicely furnished, are just that: you’re outside with a view of the castle. 18 rooms, including 4 feature rooms and 5 deluxe rooms in the main castle; suites, lodge, and “Castle View” rooms in annex across from the castle. Langley is off A69—the main highway between Newcastle- upon-Tyne and Carlisle. Just west of Hexham, turn south on A686. The castle is signposted. Hexham is connected by train with Newcastle. Yes. Civil ceremonies. Inquire hotel for details. Langley is built in a popular 14th-century style, featuring a grand oblong hall with seven-foot-thick walls. Four turrets at each corner contain the main rooms. An added fifth tower that once served a defensive purpose now holds the main entrance, stairway, and guardrooms. Each of the “feature” guest rooms beautifully integrates with its unique architecture. The Josephine Room has a large alcove set in the wall where you may have breakfast and gaze at the view, while the Cadwallader Room features a stone archway over the bathroom sink and one wall of solid stonework. Each room features wall sconces, rich fabrics, and a different style of canopy bed. A few rooms have sunken bathtubs and saunas. Castle View rooms—so named because they have views of the castle, not from the castle—are furnished comfortably in keeping with the theme of the castle. You can relax in front of an open fireplace in the impressive second-floor stone-walled drawing room (once the castle’s main hall), perhaps with a pre-dinner drink from the adjoining oak-paneled bar. Featuring open beams, tapestries, and another fireplace, the Josephine Restaurant offers a traditional English menu. A unique architectural feature of Langley Castle (and one of the finest remaining examples in all Europe) are the garderobes or medieval latrines, a facility almost unheard of in period castles. Langley has 12 of them.